Carrying two mortgages will make you rethink your finances, mainly because you have no other choice. That’s the position we found ourselves in this past summer when we randomly (divinely?) found the “just right” house for us, before our old home was even listed on the market. It was a good practice for us to pay close attention to the money leaving our accounts every month. I am no expert in the realm of finances, but these are some personal goals and practices that I try to keep up as much as possible. 1. Keep track of the outgoing. Online banking is helpful for me in this way since it’s always up to date and tracks all spending and bill pay in one place. 2. No debt. Of course easier in word than practice, but less debt = less stress. We only have one credit card and use it sparingly + pay it off quickly. 3. Charitable giving. Be on the lookout for opportunities to give that are meaningful to you/your family. One that is important to me is sponsoring a child in Thailand who I met when I was there in April. 4. Where you spend is important. Whenever possible, buy from companies that provide safe environments and fair wages. Here’s one article that has influenced me on this topic. 5. Accountability. My husband and I share accounts so everything is always visible to the other. Also – no large purchases without discussing first. 6. Monthly/weekly allowance. Setting a certain amount of spending money for each week has helped us keep our small purchases like coffee in check. 7. Make returns. If something doesn’t work or fit, or you just change your mind – take it back! Don’t just stick it away in a closet and forget about it. 8. Online bill pay. Everything in one place keeps finances simple. 9. Prayerful consideration over major changes or purchases. We did not decide rashly to buy a second home without lots of prayer and crunching numbers to make sure it was a smart decision. 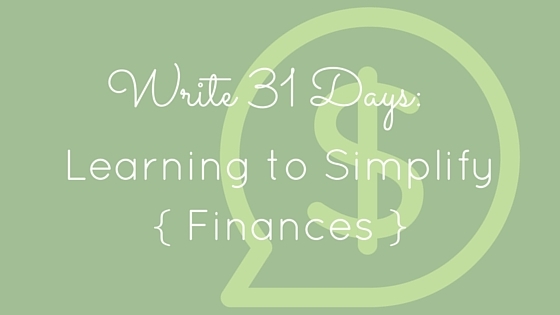 I don’t want to just streamline my finances for simplicity’s sake. I want to be a good steward of my blessings and resources, and make it a priority in life.